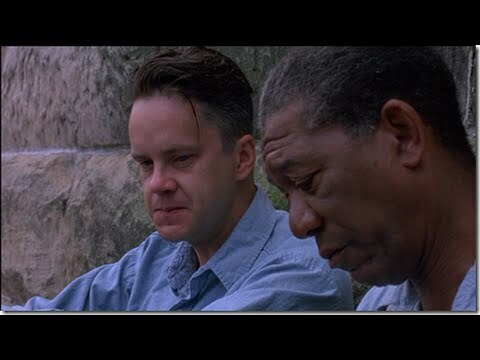 1994's 'The Shawshank Redemption' tells the story of two inmates, Andy Dufresne (Tim Robbins) and Ellis Boyd 'Red' Redding (Morgan Freeman), struggling to survive and better their lives while incarcerated in a tough Maine prison. The movie, based on a short story by Stephen King, received a whopping seven Oscar nominations (including Best Picture and Best Actor for Freeman), but failed to win even one. Nevertheless, 'The Shawshank Redemption' remains a critically acclaimed movie that often finds itself on top film lists. 'Shawshank' is a memorable movie, with equally memorable quotes. Enjoy! Red: "Get busy living…or get busy dying. That's goddamn right." This brief quote summarizes Red's general philosophy about life, which he shares with Andy. Either you get in there and start living it, or you run the risk of simply wasting away. Red: "I find I'm so excited I can barely sit still or hold a thought in my head. I think it's the excitement only a free man can feel. A free man at the start of a long journey whose conclusion is uncertain. I hope I can make it across the border. I hope to see my friend and shake his hand. I hope the Pacific is as blue as it has been in my dreams. I hope." Red's quote is part of his monologue that ends the movie. We learn that yes, he does indeed realize his dreams - about reuniting with Andy and about finally being free. Red: "There's not a day goes by I don't feel regret. Not because I'm in here, or because you think I should. I look back on the way I was then: a young, stupid kid who committed that terrible crime. I want to talk to him. I want to try and talk some sense to him, tell him the way things are. But I can't. That kid's long gone and this old man is all that's left. I got to live with that. Rehabilitated? It's just a bulls**t word. So you go on and stamp your form, sonny, and stop wasting my time. Because to tell you the truth, I don't give a s**t."
At his parole hearing, Red asserts his own terms of redemption, explaining that his definition is quite different from that of the system. A stunning scene with the incomparable Morgan Freeman, without question. Andy: "Hope is a good thing, maybe the best of things, and no good thing ever dies." The message of hope is threaded throughout the film. In this powerful scene, Red finally comes to understand that Andy's message of hope was true - that it can indeed set a man free.